In the world of coffee and espresso there are two main contenders, these are the Arabica & robusta varieties of coffee. When it comes to Arabica vs Robusta coffee beans, what do you need to know? The term Arabica or Robusta is simply a reference to the species of coffee being grown. Not to be confused with the area in which a particular kind of coffee is grown (eg. Brazillian, Java, Kenya, Sumatran). It is possible that you could find either Arabica or Robusta being grown in a given region - depending on the climate and it's suitability. While there are other coffee varieties, Arabica & Robusta are the two commercially produced and consumed coffees. Robusta Coffee (coffea canephora) are a high bearing crop of coffee which is disease resistant. This means due to the higher yields, Robusta tends to be a cheaper coffee for the end consumer to purchase. 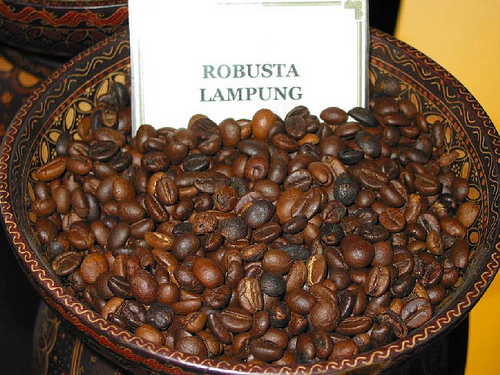 Robusta produces a very full bodied and strong coffee, known for its earthy flavours. Due to the strength and high acidity of this coffee it is unlikely to be used on its own and will blended with arabica beans to round out the flavour profile to create a desirable blend for consumption. Robusta coffee is also known to contain a higher amount of caffeine than that of the Arabica bean. The use of the Robusta coffee in a blend can assist in producing a strong, full bodied coffee, while the Arabica will help in balancing the tasting profile. Robusta would likely be used in 'Italian' style blends to assist in achieving the desired strength. The resistance to pests and high bearing crops of Robusta mean that when used in a coffee blend, the coffee may be offered at a cheaper purchase price than that of a 100% arabica blend. Arabica Coffee (coffea arabica) accounts for approximately 80% of the worlds of coffee production volume, the plant produces a significantly lower yield with each tree producing between 0.5 - 5kg. Together with the lower yield compared to Robusta, Arabica is also a more difficult plant to cultivate due to its lower tolerances for frost and disease. Arabica coffee is by far the most popular and widely consumed bean and unlike Robusta, you can find and use a 100% blend of Arabica beans. This species of coffee generally exhibits a sweeter profile, with fruity and zesty flavours as well as a strong 'coffee' aroma. As arabica is highly influenced by the climate in which it is grown it is possible to produce a 100% arabica blend using beans from different regions which will result in a well rounded, full bodied coffee - suitable for espresso. Alternatively it is versatile enough to use as a single origin blend that highlights the particular characteristics a specific growing region imparts on the bean. The versatility and desirable flavour profiles mean that Arabica is highly sought after, while the lower yields and the fussiness in growing the crop result in a dearer product. When looking for your next bag of coffee, you may like to ask the roaster about the characteristics you may experience and what types of beans have been used. The most important thing at the end of the day is not what beans have been used, but whether you enjoy the brew that they make. This trial and error is half the fun! !